Vegetable barley soup is nutritious, full of fiber and low in calories. 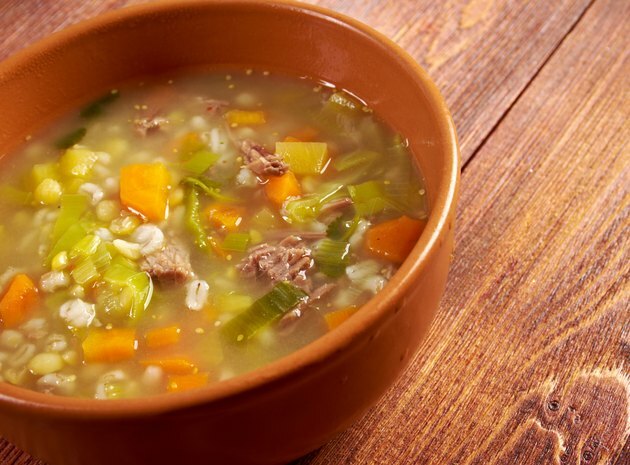 This soup also gives you more than enough of two important vitamins per serving: vitamins A and C.
One 1 1/2-cup serving of vegetable barley soup supplies you with 160 calories. Seventeen of those calories are fat calories. The main feature in barley soup is barley, but vegetable barley soup also contains a lot of vegetables. Vegetable barley soup usually features tomatoes, carrots, onion, garlic, zucchini and mushrooms. Vegetable or chicken broth and vegetable juice are other ingredients found in vegetable barley soup. This soup is seasoned with basil, salt and pepper. If you are not on a calorie-restricted diet, or you want extra calories, consider adding higher calorie vegetables such as corn to this soup. One-half cup of cooked corn contains 90 calories. For additional flavor, calories and healthy polyunsaturated and monounsaturated fat, saute the vegetables in a tablespoon of extra virgin olive oil before adding the broth to them. My Pyramid.gov: What are 'Oils'?